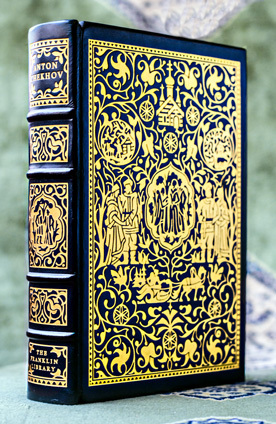 We’re very excited to have located another copy of Chekhov’s Peasants and Other Stories – a beautiful, full leather, Limited Edition copy that has so much gold on it we’re convinced the value of the gold on the book is worth more than the book itself. In any case, it’s due to arrive in 3 weeks and is available for pre-order. We’re also looking forward to a Limited Edition, full leather version of The Best of Sherlock Holmes – the first rare Sherlock we’ve ever acquired (other than special orders). Yay! And speaking of Sherlock, when oh when will Season 3 of the wonderful British TV series Sherlock, starring Benedict Cumberbatch (who plays the much less interesting Kahn in the new Star Trek), finally be aired?? !